Tall, strong, and with all the right gear: a jersey made of some new-age material, an arm sleeve like LeBron James wears during games, and, come to think of it, LeBron’s latest shoes too. The guy just plain looked like a great player. Then the game started and we realized: He was awful. He looked the part, but when it was time to ball he couldn’t even play. I still don’t know his name. Today, I just call him Average Content Marketer. See, average content marketers are far too concerned with looking like they can do the job. They endlessly research all the tech, tactics, and tools. They obsess over the latest gurus and experts, retweeting and repurposing the thinking. They know all the growth hacks and sound so very smart when presenting their ideas to their teams or boards. We need to reset this industry to first principles – and fast. First principles are best principles and best principles are simply more important best practices. There’s a way of thinking popularized by the great Elon Musk of Tesla and SpaceX fame: reasoning from first principles. The idea is simple to understand, hard to execute: Rather than rely on conventional wisdom to inform your logic, distill something to its fundamental truths – i.e., “first principles” – to develop your own thinking. The concept of “first principles” comes from physics, referring to the basic but hard-to-reach truths about the world. Ol’ Muscles McGee had all the right gear and looked pretty darn professional as a basketball player, but then the game started and he couldn’t play. But playing basketball is what basketball is. Similarly, when content marketers, say, launch a podcast, most will ask experts about the right technology, the right distribution techniques, or the right way to measure the success of a show. But when it’s time to record, how many are any good on a microphone? How many even think about it? But being good on a microphone is what podcasting is. I’ve watched companies build expensive in-house studios before launching their podcasts. Why in the world would you do this before ensuring that a podcast was worth your or your audience’s time? Why not invest that same money into training your host to be the world’s greatest or researching your audience members to know them more intimately? That studio is incremental, not fundamental. As an industry, we’re losing our way in content marketing. We’re losing touch with what all this stuff is actually about, drowning in tips and tricks and how-to guides. We have to clear away the conventional wisdom and trendy new tactics that clutter our view. What if we focused on the fundamentals instead? What if we paid more attention and clung more tightly to best principles instead of best practices? Luckily, we’re surrounded by examples of those who have done exactly that. They can inspire us and empower us to break from our obsession with a nice, neat, packaged list of tips. To more bashful crowds, Suzy Batiz introduces herself as the CEO. To her team, however, she’s the PEO. 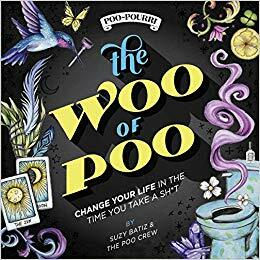 “I’m the poo executive officer,” she told me in an interview on my podcast, Unthinkable. All of this started when Suzy made a simple observation about one very smelly problem. Her brother-in-law had just emerged from the bathroom during a party and lamented to Suzy, “Why can’t we figure out how to deal with odor properly?” Being a lifelong entrepreneur, Suzy couldn’t stop wondering if there was a better way to solve this problem. But to solve the problem she first had to understand it. She had to reach the first principle of the matter. She realized, “(Odor) is airborne. Once the odor is created, it’s going out into the air. So I was curious to figure out if we could address the problem before it starts.” Over the next few months, she formulated a new type of spray. It wasn’t an odor-masking spray, like Febreze, but an odor-trapping spray. You simply spray the product onto the water before you go and the oily film it creates then traps odors below the surface. They never even reach the air. She cut through the conventional wisdom used by her competitors to examine the details of her world in a more foundational way. She found the first-principle insight and, by addressing it, has created raving fans and generated more than $300 million in sales to date. And the punchline? Build your company – and your content – around the first principle of the problem you aim to solve and you’ll resonate more deeply with customers. By publishing content that explores this first principle – particularly how your customers relate to this central truth – you demonstrate not only that you understand the problem better than anyone else but also understand them. But best principles don’t merely apply to direct-to-consumer companies. They can be transformative in even the most competitive B2B niches. InVision – one of dozens of companies that sell prototyping and project collaboration tools to software designers – has somehow separated from the pack. It didn’t do it by buying some advanced technology. It didn’t do it by studying the sneakiest tricks or smartest best practices. InVision is beating the competition because of a first-principle insight about its customers. It began when marketing manager Clair Byrd was busy creating case studies for the company. In almost every interview she conducted, she noticed a strange trend: InVision’s customers got defensive. While they clearly loved their jobs, they kept justifying at length why product design was so crucial to modern tech companies. It was clear that something deeper was happening, so Clair investigated this problem further. By spending more time with InVision customers, as well as asking them why they get so defensive, she realized that “product designer” simply wasn’t a common title. Whereas InVision wanted its customers to talk about how they created their designs (the action InVision’s product enables), the customers wanted to talk about something else: the need for product design to create an identity in the business world. Clair had reached the first-principle insight, using it to inform all her work in marketing. She knew she couldn’t create another average case study. And so, to rally an entire industry around the brand and to help provide an identity to a career path, Clair and her team created Design Disruptors, an hour-long documentary film featuring some of the world’s best design thinkers from companies like Google, Facebook, MailChimp, Airbnb, Salesforce, Zendesk, HubSpot, Spotify, Dropbox, and more. But here’s the thing: InVision never released this film publicly. Instead, through both the work of its team and volunteers in its audience, InVision premiered the documentary in offline community meetups – over 1,000 across more than 450 cities worldwide. In total, the documentary generated 70,000 highly qualified leads from some of the hardest-to-reach companies in the world, all of whom now look to InVision to lead their industry. In one year, InVision doubled its total product users and, to date, has raised over $155 million in venture capital funding, making it the most well-capitalized company in its crowded space. Design Disruptors was a large and expensive project. It might seem crazy to film a documentary instead of a series of case studies, but that view is the product of conventional wisdom – that content marketing is about selling tools, marketing features and benefits, and creating PDFs and how-to articles. That’s what I call “last-mile marketing” and, too often, marketers focus on only those moments immediately before someone decides to buy. Instead, if marketers ran with them every step of the way, that last mile would seem like a no-brainer for them to take with the brand or product in mind. In other words, Clair knew she had to solve the fundamental problem (product designers needed an identity) before InVision’s marketing team could address the incremental problem (product designers need tools). It’s a logical argument, not an innovative idea: If product design lacks an identity, companies won’t understand its value. If companies don’t understand its value, they won’t prioritize product design. If companies don’t prioritize product design, they won’t provide budget or buy tools. To get to that last part and make it more likely to happen, InVision had to address the first principle. What if we did the same in our industries too? As an industry, we see things and collect data and create and promote content all the time, but do we stop and think critically? Do we ask why? Do we ask anything – like anything at all? Or do we cling to the best practices and latest trends, acting without understanding? Do we see or do we observe? That is the content marketing conundrum today. We experience it all the time. When we applaud each other for saying things like, “Focus on the audience,” or “Write blog posts for people, not search engines,” we’re tipping our hand. We’re revealing we’re so focused on the incremental stuff that the fundamentals now seem brilliant. But they shouldn’t. They should be table stakes. And knowing the root of the problem we set out to solve – both with the product or service and the content we produce – should also be table stakes, as should knowing the real reason the audience would read or listen or watch or share or, of course, purchase. Nobody buys a poo spray. They buy confidence that they won’t be embarrassed. Nobody buys design software. They buy the certainty that their work matters in the business world. The self- and situational awareness that comes with finding first-principle insights in our work far outstrips anything that can be listed in a blog post, ultimate guide, or tutorial video. Know your customers, know your craft, and, most importantly, know yourself. These are the foundations of good work and these can’t be hacked or gamed. There is no shortcut, no app for that. First principles are found through investigation, through daily detective work into your environments. Experts know absolutes, but investigators use evidence and, in doing so, find better ideas than any best practices can provide. Sure, throw on a headband and lace up those sweet, new LeBron shoes. Buy some drinks built by science and some protein bars too. Do everything you need to do to look like you can do this stuff. But when the game starts, just remember: You better know how to play. 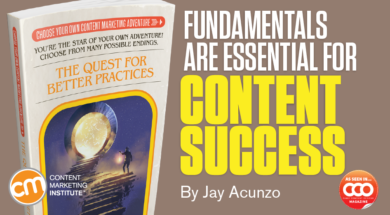 A version of this article originally appeared in the August issue of  Chief Content Officer. Sign up to receive your free subscription to CCO today.